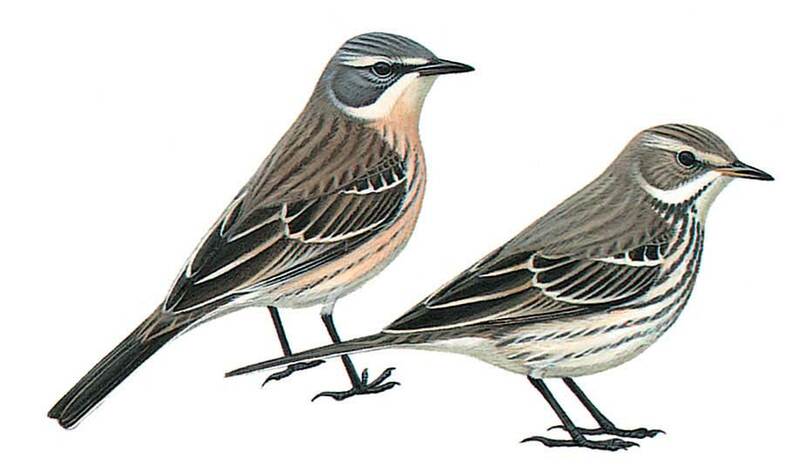 Resembles slightly larger, more robust, lighter streaked version of Meadow but legs blackish brown (exceptions occur); compared with Meadow crown and mantle greyer, more indistinctly streaked and underparts whiter; in breeding season breast variably tinged rosy-pink and practically unstreaked; creamy white supercilium generally more pronounced. In winter, browner above though still greyer than Meadow; whiter underparts sparsely but distinctly streaked but some have almost unstreaked, pink-tinged breast. Outer tail-feathers white.